Say it ain't snow, the winter that keeps giving has another trick up its sleeve. For many in the Upper Midwest this winter has dragged on far too long. 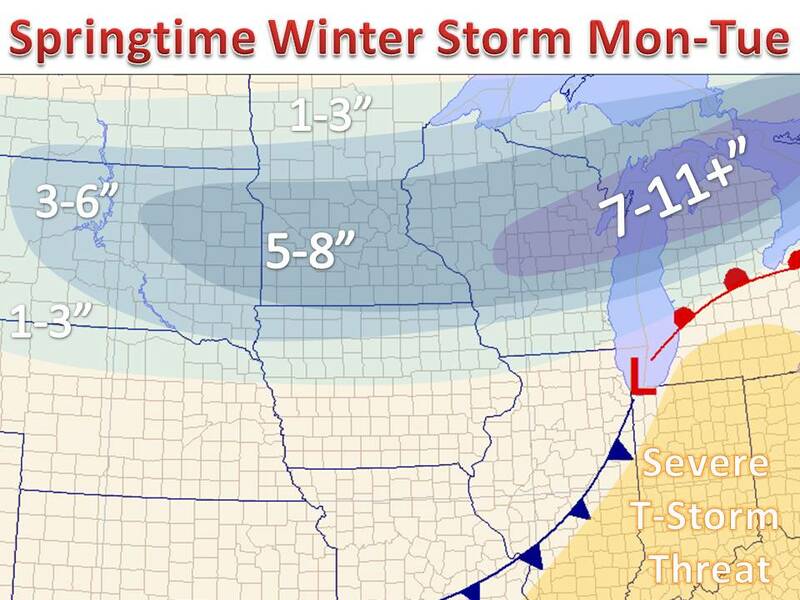 Even though the calendar may say April and baseball is underway, a major winter storm will drop a wide swath of around a half foot of snow by Tuesday night. 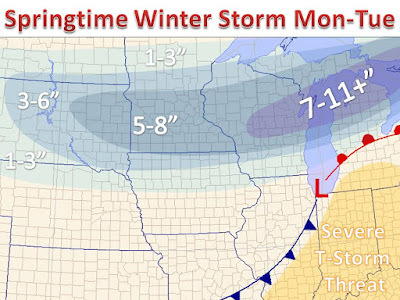 Snow will begin to develop today, with the more moderate snow coming into the region as the low pressure begins to develop near Chicago. Much of the snow will fall during the day, so ongoing melting is expected with the strong April sun angle, which will hamper some of the accumulations of a heavy wet snow for most. Meanwhile, in the warm sector, an area of strong to severe thunderstorms will develop across the Ohio Valley down through the Lower Mississippi River Valley. Large hail, damaging winds, and a few isolated tornadoes are all threats Tuesday afternoon and evening. Below is one model's take on how the storm system will evolve into Tuesday, powered by Tropical Tidbits. After the low pressure slides east of the region, winds will kick to out of the northwest, with cold temperatures expected to hold right on through the weekend, with a couple additional chances for snow into the middle of the month. More weather info always on Twitter.